These Farm Heroes level 415 cheats and tips will help you beat level 415 of Farm Heroes. The objective of Farm Heroes level 415 is to reach 100% growth by collecting 110 apples, 110 strawberries, 110 water drops, and 5 dragons in 23 moves. It’s a big challenge to collect 5 dragons in just 24 turns. It’s even bigger when you have to deal with frogs eating your cropsies. Fortunately, none of them are cannibals and will leave your eggs alone! Obviously, you need to make dragon-hatching a priority. There are plenty of ways to get all of your other required cropsies–even with the frogs–but your dragons will take more effort than anything else. In this respect, the frogs are more of an annoying obstacle than anything. They’ll get in the way of your egg matches and can’t be shuffled around by matching. You’ll need to make matches next to them in order to get them to move. 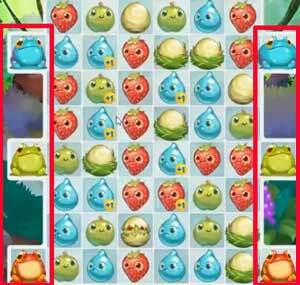 Strategize carefully which frogs you want to move based on what cropsies you want to keep. If you have a lot of apples with bonus points, for example, you might want to wait on moving green frogs until after you’ve harvested some of those cropsies. As usual, you can use any booster to your benefit here, but some will be more useful than others. The magic shovel will, once again, be a godsend. In the screenshot above, you can see our player using the shovel twice in a row to get out of a jam in the late game. She wound up with only three moves left to collect one more dragon, but if she created one cracked egg naturally now, there’d be no way to create another in time! The solution was simple: our player used the shovel to crack both plain eggs next to the already cracked one, quickly creating a dragon with no extra fuss or muss. She didn’t even disturb the frog. Shovels are also great for creating extra-large matches. Keep an eye out for two pairs of matching cropsies in a row or column. If there’s another one directly above it, you can use a shovel to work your way to a row of five (see next page). 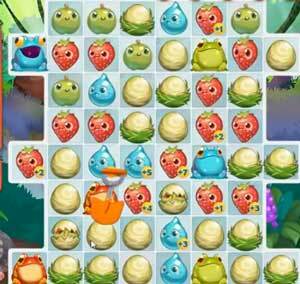 Another very useful booster in Farm Heroes Saga level 415 is the color collector. You can use this to harvest a large number of matching cropsies at once. This is very useful late in the game or if you need a bit of insurance against the frogs. If there’s one saving grace of this level, it’s that there are no cropsies here that won’t contribute to your growth score. Everything is required. Since there are only four kinds of cropsies altogether, cascades are very easy to trigger, especially if you work low on the board. As we mentioned before, look for pairs of matching cropsies that are close together. Rows of 5 cropsies have a very special effect on the board–they’ll collect all cropsies of one kind, acting as an automatic Color Collector. Other matches of 4 or more are also great, since they’ll distribute bonus points. Protect those points from hungry frogs!